The Physics Model determines how the particles move. It may help to think of these options as a setting for whether the particles behave as a solid (Bounce), a liquid (Fluid), or a gas (Air). Air: The default setting. This model is useful for making particles that move naturally through air. Read more on the Air group page. 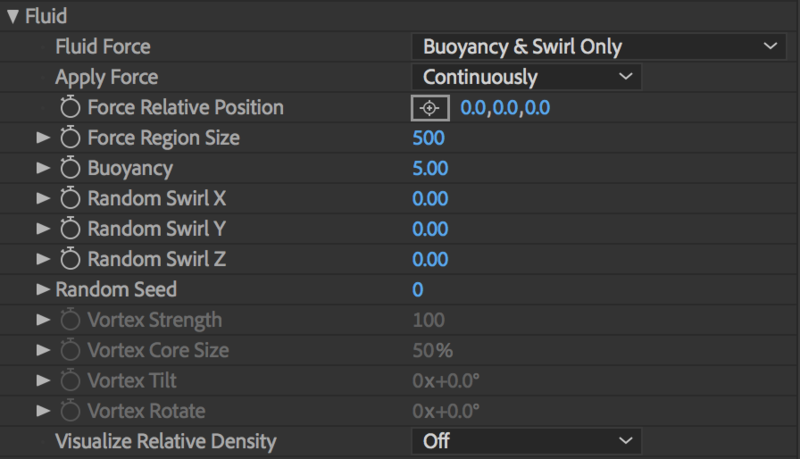 Bounce: With this model, particles can bounce on layers in the composition. Read more on the Bounce group page. Fluid: With this model, particles act like a liquid. Read more on the Fluid page. Gravity makes particles fall downwards in a natural way. The particles pick up speed as they fall, just like any object in real world would. Low values make the particles fall slowly. High values make the particles fall more quickly. This parameter enables full control over the particles' time travel. Time Factor can be used to speed up or slow down the particle movements, or freeze them completely, or play their movement backwards. All actions are keyframeable. Read more about Physics Time Factor. Note that this setting is disabled when fluid particles are enabled, as fluid particles have their own time factor parameter under Global Fluid Controls below. The Air model is useful for making particles that move naturally through air. This group is active when Air is chosen in Physics Model. Read more on the Air group page. 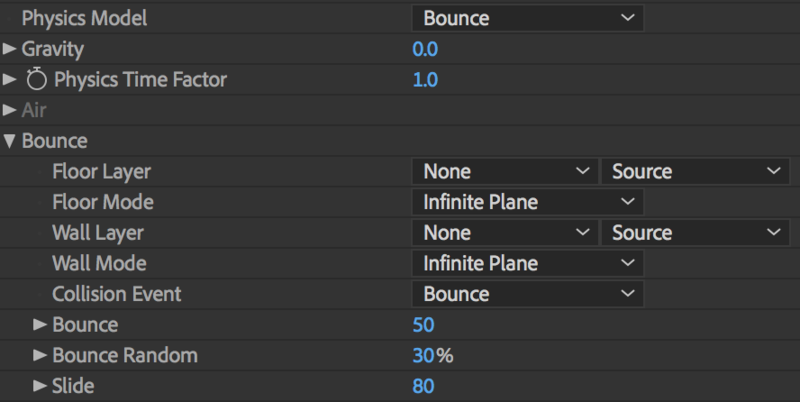 The Bounce model is used to make particles bounce on layers in the composition. This group is active when Bounce is chosen in Physics Model. Read more on the Bounce group page. The Fluid model is used to make particles behave as a liquid, with options to add buoyancy, swirls, and vortex forces. Read more on the Fluid group page. Related to the Physics Group are the Global Fluid Controls, which solely affect systems in your effect that are using the Fluid physics model.